We’re excited to officially announce that The Golf Club is coming PS4 this summer! We’ve been working hard on the core of the game to get the fundamentals right and are at a point now where we’re closing in on the finished game. If you are lucky enough to be at E3 this year, we will be demoing the game on PS4 on the expo floor – so come by and see the game in action! If you’re not familiar with The Golf Club, it’s a realistic golf simulation game that features procedurally generated courses. With only a few button presses you can be playing a brand-new course that you can share with your friends. For those who feel creative, we also have a fully-featured course editor that allows you to customize, tweak, sculpt and craft any course you can imagine. All of these courses can be shared with your friends where you can rate them and favourite the ones you love. When the game ships, there will be over 20 officially created courses included with the game along with a number of official tours and tournaments to compete in on day one. There are also five unique themes that can be applied to created courses to capture the particular atmosphere you’re after. The Golf Club also has what we feel is a fresh model for online interaction. Using what we like to call “ghost balls” you can compete against your friends’ best round on a course or your closest rival’s round without them needing to be online. You can create your own custom tours and tournaments and compete against the world – all completely asynchronously. You can compile your favorite courses, the hardest courses – or just the most interesting that you’ve encountered into your own personalized tour and share that with the world. These tournaments can be short time-based affairs, or perpetual competitions where you’re constantly leap-frogging your friends for top spot. We’ve also introduced what we feel is a unique take on turn-based multiplayer – you can turn on “Turn Order” rules at any point during a match against both live opponents and ghost balls for a seamless multiplayer experience that still lets you play through courses and tournaments at your own pace. The social side of The Golf Club is also important and we’ve made it really easy to always be able to see where your friends are within the game. Join them on another course with a single button press, and receive alerts any time they beat your score or discover a new course. Since The Golf Club relies so heavily on user-generated content, discovery of that content is going to be a key problem to solve. Besides the rating and filtering system available in game, we are planning to have curated selections and selections based on your performance and preferences surfaced onto your PS4 dashboard in the form of live tiles. Featured courses, courses by your friends, and other suggestions will appear right on your dashboard – making it easy to see all the action happening in The Golf Club! You can find all the latest news and updates as we approach release at thegolfclubgame.com and via @thegolfclubgame on Twitter. We’re really excited to be on PS4 and can’t wait for everyone to be able to play the game. Feel free to ask questions about the game in the comments below! Let me know when Hot Shots PS4 is announced. Wow, this game looks really cool! 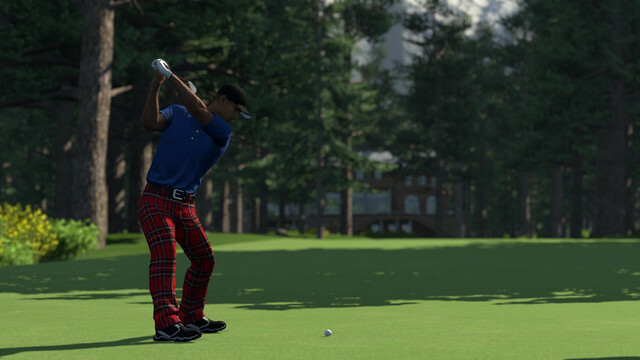 I’ve always liked the Tiger Woods franchise, but I really like the customization and creation aspects of the Golf Club. Looking forward to checking it out. What price point are we talking here? PSN or Retail? @1: lol, that’s what this made me want as well. I really want a new Hot Shots Tennis though. Oh, props on PS Move and Morpheus consideration. I might really buy this game based solely on the pun. I love golf games. I own every Tiger Woods PGA Tour since the PS2. 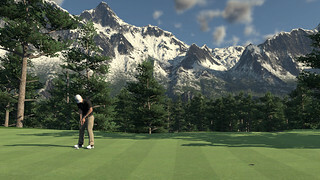 With this new game, HOPEFULLY, its a worthy successor too suplant TW PGA Tour, since last year’s game was the last one. Depressing it got cancelled. Anyway I can get into that BETA? Can’t wait for next-gen Golf! When a golf game South Park’s style? Jajaaj. Hi – I am Lorin, the Community Manager for The Golf Club! To answer a few of your questions….it will be a PSN only title, not retail. No price has yet been announced, but….Early Access on Steam is $34.99, if that gives you an idea of the range. The Golf Club will not have Move support at launch, but, as Peter mentioned in the article, it is something we are heavily looking in to and would very much like to implement. And, as for 1080p @ 60fps…well, as you can imagine we can’t commit to anything like that until we actually ship…but that is definitely our goal. Also, not mentioned in the article…we added turned-based multi-player as well, which can be enabled for live play or with the ghost balls! For answers to all sorts of other questions, I highly encourage you to check out our Official Forums at http://www.hb-studios.com/forum/index.php We try to be as open as we can with and care a great deal about our community and we have a very active one there! Can you give a hard stroke to your opponent’s ghost balls? In all seriousness I mean is there any interaction with your offline opponent? This game looks beautiful. And I’m not even a golf fan! lol. I’m buying this game. People who aren’t real golf fans will may dig this, like CommandingTiger. But as someone who’s spent countless hours playing Tiger Woods, I’ll pass. No real golfers, no real courses, stiff, generic animations, last-gen visuals, no real-time multiplayer… Sorry, but although PC gamers probably love this, this isn’t the type of quality PS4 owners have come to expect. I, too, really want a Hot Shots Golf game on PS4. As far as golf sims go, I’ll wait to see if the next Tiger Woods interests me, because that is the type of AAA experience golf fans want. I cannot wait to have my Headset on and my move controller in hand enjoying a beautiful round of Golf. Seeing a creator tool brings back memories of Sim Golf for PC. Someone needs to do something like that for next gen! I guess it’s time to stop saying “next gen” lol. Nice addition to the PS4 library. If it has MOVE support I will pick this up for sure. are you a golf fan or a Tiger fan? I am hoping the creation tools are good enough that the community can accurately recreate every major PGA tour course and maybe even create custom golfers to share with everyone else. This way we can have an unbelievable amount of course and not get nickel and dimed to death by EA when we want more content. This of course may be wishful thinking on my part, not having played or seen much about this game. Oh and custom tourneys would be cool….I want to play the Ryder Cup in any golf game I play. Beavis, your ghost balls are filthy. Go wash them in the ghost ball washer. It’s hard to tell from the short video, but parts of this look very nice (the water for instance), while other parts look not so good (the flicking trees and shadows). If they can work out the kinks I think could be a great golf game that might even give Tiger Woods a run for the money. The fact that you can design your own course and share it online is a big plus here. I would imagine if this takes off we might see perfect replicas of real life courses.. even the small home town courses and that would be interesting. No more nickle and diming from E.A. to play new courses. I think this game looks great and the fact that it’ll be at E3, will be a HUGE test for this game. There were only 10 or 15 devs that worked on this game, if it gets well received then at E3 then that would be a major accomplishment. Also, @SpooNManX, I believe it’s just early footage, I noticed the flickering trees, shadows, etc also, but again I think that was earlier footage so it might even look better than that. @+ cjmp: Fair enough. I look forward to seeing more of this. I’m not a golf fanatic or anything.. I don’t even like watching it on TV, but I enjoy playing video game versions for some reason. Tiger Woods has been fun, but they need some good competition to shake things up a bit. Maybe this is it? Does anybody know an exact date, or is it just a dangling carrot. This actually looks pretty cool. I’m interested! Finally, a golf game with an editor. I don’t love Golf but my friends will love this so I might pick it up eventually to play some games instead of just playing GTA V golf forever… especially because in this game you can make your own courses!!!! Being able to make your own stuff in a game seems to be a lost thing these days, but it’s a HUGE thing. Look how huge Little Big Planet got because of user created stuff. I wish shooters, racers, and other genre’s would take this feature seriously. Look at how awesome the map creator in Timesplitters was on PS2. Game looks very nice although I think AA is most important in a game like this because aliasing in the shadows can easily take you out of the experience of “being there”. Hope the graphics can be smoothed out even more. Yawn….not to rain on the excitement here but a game about golf? Sounds very boring to me. Procedurally generated courses that you can share with others sounds great. Can’t wait to try this one out. Since I only pick up a new EA Sports golf game every couple of years, this will hopefully be a nice breath of fresh air. I’m excited to see a golf game that isn’t stuck at the same boring pga courses. I’m hoping the course editor will allow for some very creative courses. I have The Golf Club on Steam. It’s a great game so far. The devs seem to really care about the game. Every time I turn it on it seems to have had another update. If I can talk my brother into buying it on PS4 I’ll buy it again. I made a short video for a friend and my brother a while back to see a bit of the course creator and stuff like that. You can literally make a course in seconds. But you can also go as deep into the creator as you would want, shaping the land, adding tress, lakes and stuff like that. It would be nice if there was a release date on the horizon. One gaming site listed Spring 2014, one lists Q2 2014, and another just said Summer 2014. Seems like it keeps getting pushed further and further back. It looks like a great game, but don’t hold your breath.